Our boat is a steel cutter, a 45' Roberts Mauritius. 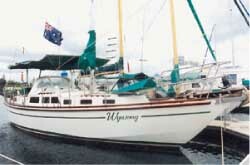 She was named 'Wynsong' and was built in 1992 by Peter Stuckey. The previous owners were Neil and Glenda O'Hanlon who bought her in 1996. She has a center cockpit, two double cabins (V-berth at the front, double in the aft cabin). We renamed her 'Meridian of Sydney'. (Meridian and Meridian II were already taken on the Australian Ships Register.) The name is taken from our children's names Meredith and Ian. The engine is a Detroit Diesel 3D-172, 101 HP (gross), 73 SHP which is plenty. She will do 8.5 kts at 2000 RPM. Here's the photo that appeared in Trade-A-Boat. (The two yellow masts belong to a boat alongside). Here are some of the digital pix I took while she was being surveyed. You can see the long keel, which is something we were hoping to get for the sea-kindly characteristics. Here are some interior shots.